You have two types of searches you can do once inside of you Unicorn Smasher. Primary Search: There is a primary search, where you can look for any particular keyword or phrase you've added to the Dashboard. Secondary Search: A secondary search allows you to see the search results for just your favorite saved searches. 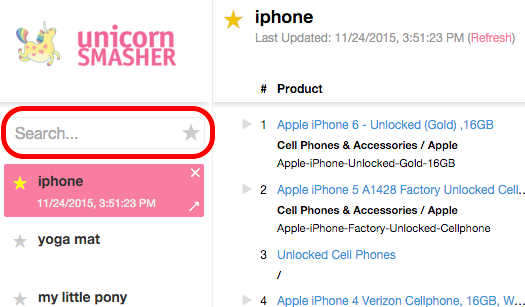 From the Unicorn Smasher 'Dashboard' enter your search term into the 'Search' textbox. The tool will automatically start narrowing down your results as you type. Keep typing until you find your desired Saved Search. If you didn't find what you were looking for broaden your search term. Once you are in your dashboard, you will see the Saved Searches on the left. 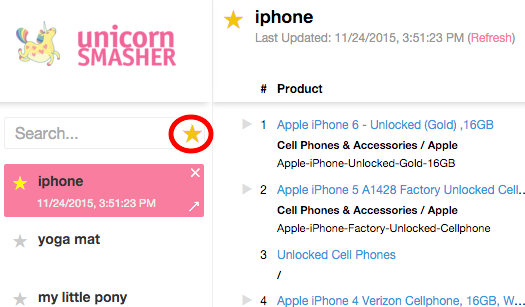 After adding a product into the dashboard, you can click on the 'star' next to the product name, so it turns from grey to yellow. 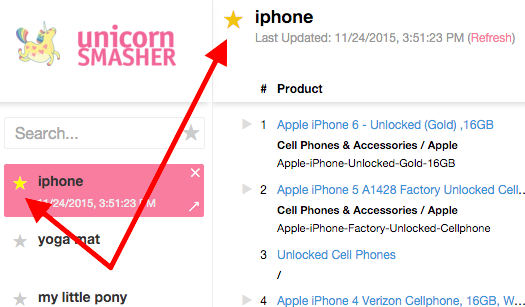 You can do this for a number of products and it will keep your saved searches on the side with the star highlighted in yellow. Click on the 'star' in the Search box. Enter your search term into the 'Search' textbox. Any Saved Search with is not a Favorite will be filtered out of the search results.